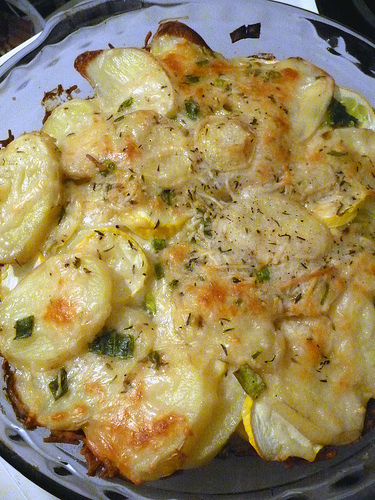 Last night I made a super delicious potato and squash torte after seeing it on Erin’s blog. Seriously. Good. It was really a great combination of relatively simple ingredients and plus you can trick men into eating squash when you douse it in potato and cheese. Actually, I think Paul likes squash too, so I picked up some pattypan squash at the farmer’s market today. I’m not sure what to make yet- so if you have any (easy) suggestions please do pass them on. I also wanted to mention this crochet hook roll-up tutorial I made/wrote for Craft Stylish. It’s quite crafty and quite stylish, if I do say so myself. And it’s very easy to make, because I started off with a placemat. I’ve been using it for the last few weeks and I love that it fits ALL of my hooks (due to the length of the placemat). This would be a great gift for the crocheter in your life, and if I had more time (and more crocheting friends) I would probably whip some more of these things up. And in blatant self promotional news, I have a project in the now available Vogue Knitting On the Go! : Grannies. Yep, that’s my project on the cover. I had a lot of fun playing with the colors and placement of the hexagons, and yet remember being quite harried to finish the whole thing before Thanksgiving (when a friend came to visit). This was one of the first/only projects I can remember where Paul asked if I got them back afterwards. Awww. But sadly no. 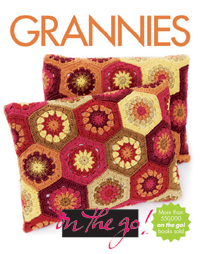 The book is full of cute interpretations of the granny, so check it out at your local craft or yarn shop. And a nagging voice tells me that I forgot to mention that I had projects in this edition (Volume 10) of Sew Simple- but I think it’s still on newsstands if you want to grab a copy. I have some pretty patchwork placemats and patchwork oven mitts inside. Some of my favorite projects from the issue are the zippered tote (shown on the cover), a floral applique tee and a crewel lantern. That’s all for this post. Tomorrow we’re being adults and going to get our Montana state driver’s licenses. Very exciting. And then perhaps I will have time to post about my new denim skirt. My back to school wardrobe is complete! so glad you left a comment on my blog, cos now I've found you too! isn't that torte awesome? i think i am going to make it again this weekend. Congrats on the cover! I will keep an eye out for the book next time I am at B & N.
This squash potato torte looks so tasty. I never know what to do with squash, so I'm going to try it this weekend. Your crochet roll-up IS very stylish, and the pattern looks easy. 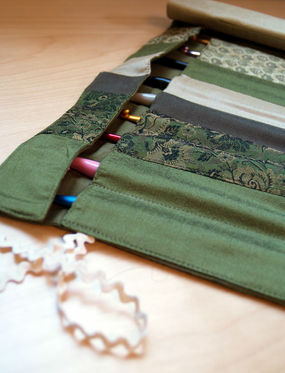 This would be a better way to organize my crochet hooks rather than in the pencil case I've been using. I love your patchwork projects in the Sew Simple magazine. Keep up the great work, and enjoy your trip to the DMV! That looks so good. I'm definitely going to try that. I have so much squash, it's ridiculous. Congrats on the projects in the 'zines!